"All around experience was great! I've hosted about 10 kids birthday parties at different venues and this one was the best one of all. Really enjoyed it!" 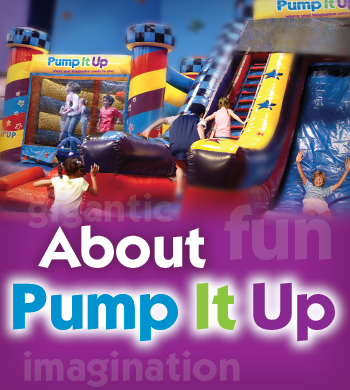 "To quote my daughter about her experience at Pump It Up "I LOVE IT!!" She had the best time and we were very impressed with the service. Thank you for making the party so effortless for us. " "The staff and coordinator during the party was very attentive and respectful of our bday wishes. They had everything ready. We were greeted with enthusiasm and warmth. It was a wonderful event at this location." "I truly thought they were all great. Every staff member I spoke to in person or on the phone was fantastic! I was pleasantly surprised at what an overall great experience hosting a party at pump it up turned out to be"
"Top notch, You can definitely tell that PIU are the birthday party experts. They made it so fun and my daughter had the best time!" Pump It Up of Belmont opened its doors for business on 11th of Nov., 2006. Swati and Naveen Gupta, the original and current owners, launched this unique business in the community that served a market segment which was underserved at the time. This family owned business and its owners have been recognized locally and in the Indus Business Journal for their passion towards the concept. 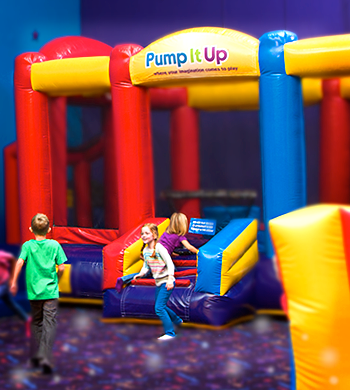 Pump It Up of Belmont has delivered tens of thousands of private events, primarily B’day parties since the day it opened. Swati and Naveen continuously strive to build a passionate team that delivers a memorable experience for their customers.